An English classic revisited, our Beef Wellington entrées begin with extraordinary Stock Yards® USDA Choice Filet Mignon. 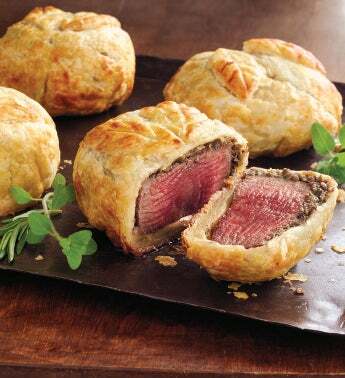 Each tender filet is surrounded by a duxelles of fresh mushrooms, onion, garlic, herbs, and red wine then wrapped in a flaky, all butter, puff pastry crust. Normal shipping days are Monday, Tuesday, and Wednesday. Orders received by 1PM ET (10AM PT) will ship the following day. Those received after 1PM ET Wednesday will ship the following Monday. Two-day express shipping with dry ice included. Items will be released by a delivery driver with no signature required. Upon arrival, keep product refrigerated or frozen.